Finding the perfect white noise machine for you and your loved ones can be pretty complicated. Which one do you go for? Depending on your needs and preferences, you’ll tolerate different types of sounds. To help you make a choice, I’ve decided to compare several of the most popular Marpac products: the Marpac Hushh, Marpac Rohm, Marpac Whish, and the iconic Marpac Dohm. If you read some of my previous white noise machine reviews, you might have already heard about some of these machines. I’ve even reviewed a few of them before, and I’ll include links to those articles in this review. Today, I’m going to look at these products more closely with the goal of giving you a clearer picture of how they work and who they’re meant for. But first, let’s talk about the company itself. According to legend (and their “About” page), Marpac is the brainchild of a man looking to help his insomniac wife. Although Jim Buckwalter was only a salesman, he engineered his first mechanical white noise machine in 1962. Shortly thereafter, he started the Marpac company which has continued to improve on the original design ever since. Even if this story doesn’t check out, I’ve got to admit, it’s pretty sweet. The company headquarters and manufacturing plant are both in Wilmington, North Carolina. In fact, according to the Marpac website, they’ve remained a fairly small company to this day. However, they’re certainly not limiting themselves to manufacturing white noise machines. Instead, they have expanded their product lineup to include everything that plays a part in improving sleep. They have several white noise machines that offer a truly unique sound experience. Most of them are mechanical machines, which means that the sound they make is caused by internal blades rather than a speaker. That’s exactly what makes Marpac machines some of the most famous ones on the market. Marpac also makes mattresses and bedding products for their YogaSleep line. The ones I’ve seen are memory foam mattresses that have a 101-night trial period. I should also note that, on the site, the white noise machines are in the YogaSound category. Finally, they also have a YogaScent line, which includes a diffuser, several essential oil products, as well as a relaxing linen spray. As you can see, the people at Marpac have really committed to giving their customers the best night’s sleep ever. But, in my opinion, they’ve really outdone themselves with their white noise machine selection. In addition to making their classic mechanical devices, they now make multi-sound ones too. Still, they do offer as many as six different mechanical or, as they call them, natural sound machines. All of them belong to the Dohm line, which I’ll be reviewing later on in the article. And there are four electric options as well. These devices range in sizes and recommended usage. The smaller ones are great for travel, and some of them are specifically made for soothing babies. However, is white noise really something that can soothe babies at all? Let’s briefly talk about that. If you’ve never given much thought to white noise, I don’t really blame you. After all, the concept itself seems fairly vague. What does it even mean? Most people think of white noise as any background sounds and, though it can be true, that’s not really what I’m talking about. When I say the words “white noise,” I am referencing the sound of static that usually goes hand in hand with television snow. Technically, white noise is a humming mix of all sounds humans can hear. However, that would actually exclude some of the white noise machines I’ve recommended in my previous articles. Usually when I’m looking for white noise machines, I tend to expand my definition slightly. I often include devices that produce ambient noises, nature sounds, and whirring noises — as some of the Marpac products on my list do. Still, not all sounds, such as music or conversation, can be as effective as true white noise for encouraging productivity and relaxation. In fact, white noise can have many positive effects on the brain. It can improve your memory and focus, and create a positive environment for people with various mental illnesses and those who suffer from insomnia as well. However, that’s not to say that it’s without risks. If you want to know some possible drawbacks of using white noise to fall asleep or while you work, you can check out the article I’ve linked to above. Additionally, if you’d like to learn more about white noise and the various forms it takes, check out my article about the colors of noise. Now that we know what white noise does and what types of effects it can have, let’s move on to the comparison. To begin with, I’ll present a brief overview of the products I’ve mentioned at the beginning of the article. I’ll also give you some of my thoughts on each of them. Then we can round up the final tally in the conclusion of the article — so let’s get to it. The Marpac Hushh is a 3.5-inch circular electric white noise machine, so it produces the sounds through the speaker in the front. The smaller circle in the middle of the speaker is actually a night light. Because the device is so small, you’ll be able to take it everywhere with you. In fact, it even comes with a flexible, yet strong, clip you can use to attach the device to a stroller or the inside of your car. The circular base of the device has a protruding handle that you’ll be able to fasten the clip to. If you’ve read my reviews of white noise machines for babies, you’ll know that being able to attach the machine where you want it is incredibly convenient. The Marpac Hushh was specifically made for people with children, and it even has a child lock button on the side. The rest of the controls are all along the side of the device right of the handle, too. First up, you have the power button, then the volume up and down keys, and the S button is how you’ll change the sound profiles. You can listen to “bright white noise” which sounds like it would be annoying, but it’s actually very pleasant. Your second option is “deep white noise” which is more similar to pink or even brown noise. And the third sound profile plays a “gentle surf”. As far as I can tell, the power button also turns the light on. This product is rechargeable via the micro USB port at the bottom of the device. Naturally, it comes with the charging cable included (but no adapter to my knowledge). The Marpac Rohm is a machine I haven’t had a chance to review before, but it does seem fairly similar to the Hushh, if only at first glance. So let’s find out whether the two are any different from each other. To begin with, let’s talk about how this product looks. The Marpac Rohm machine basically looks the same as the Hushh, except it’s white with a blue circle in the middle, not gray with a green circle. It’s 3.5 inches wide, and it has the same handle we saw on the previous device. The only other difference in appearance is that, while the previous device has a flexible clip, this one has a blue rope you can use to tie it to a suitcase or a bedpost. Marpac also markets this product as a white noise machine for travelers. To that end, it doesn’t have a child lock that disables the buttons. However, the rest of the controls are much the same, with the power button, volume controls, and sound profile key to the right of the handle. Once again, you’ll have a choice between 3 sound profiles — bright white noise, deep white noise, and gentle surf. This product also doesn’t seem to have a night light feature — although there are light indicators for charging. Like the Hushh machine, the Rohm comes with its own charging cable that plugs into the port at the bottom of the device. Ultimately, the only difference between these first two devices is that the Marpac Hushh has additional features that might be helpful for people with kids. Now let’s talk about a device that might be the most promising one on the list — the Marpac Whish. This machine more closely resembles the original Marpac Dohm I’ll be discussing in a short while. It’s about 3.6 inches tall with a 4.68-inch wide circular base. That definitely makes this device larger than the previous two, although you could still fit it into a suitcase. The power button is on the front of the device, while the rest of the options are all positioned around the speaker on the top side. The volume keys are all the way to the left, and the timer settings are right across from them. You can have the machine shut off after 6 or 8 hours, or just let it run continuously. Between the volume and the timer controls, there are buttons for each of the 16 sound profiles. Four of the sounds are variations of the classic Dohm sound, two are fan noises, and another two are white noise profiles. The rest are all either ambient noises and rain, river, and ocean sounds. According to users, you won’t be able to tell where the recordings loop, which is always a good thing. Because the Marpac Whish doesn’t have an internal battery, you’ll have to place it near an outlet. However, since the power cord is about 3.5 feet long, there’s no need to worry about it not being able to reach. Even though the Marpac Whish has the most features of all the ones on this list, many people prefer the organic sound of the classic Marpac Dohm. This is another Marpac device I’ve reviewed before in my article about white noise machines for offices. But really, this thing is pretty ideal for a lot of situations, particularly if you like the deep humming sound only Marpac Dohm devices can make. Nowadays, Marpac has several acoustic white noise machines in their Dohm line. However, the Dohm Classic is the most similar to the original device that Buckwalter supposedly created for his insomniac wife. And really, this device is incredibly elegant despite its simple design. The machine only has a single power switch that lets you choose between two speeds. But, even though there are no other keys on the device, you can still adjust the tone and the volume according to your preference by lifting and twisting the upper cap of the machine. They’ve even put up a video that shows you how to do it. If you’ve never heard a Marpac device, the video will also help you determine whether or not you like their classic sound. I’ve got to say, the sound the Dohm devices make is actually one of the more pleasant ones I’ve heard. But I suppose that’s exactly why many people gravitate toward this white noise machine even when Marpac keeps making new ones with more features. So now that we’ve seen all of this, let’s get to the final comparison. So what have we learned? After all of this, do you have a conclusive favorite? I’ve got to say, I’m undecided. Obviously, I’m partial to the original Dohm because of the pleasant noise it makes, a bit like highway traffic but much more enjoyable. The Marpac Dohm is also the first Marpac product I’ve recommended, so I’ve always really liked it. It also has an incredibly long cord, if that’s something you need. However, the Marpac Whish really isn’t that far behind, in my opinion. After all, it definitely has the most choices out of any of the products we’ve just seen. There are even 4 Dohm-like noises on it — although some users say that the recorded noise doesn’t come close to the organic one the Dohm makes using its internal fan. Finally, the first two devices I talked about, the Marpac Hushh and the Marpac Rohm are basically the same product. They’re both smaller than the Dohm and the Whish, and they both have handles and attachment methods included. Unlike the last two white noise machines, the Hushh and the Rohm are also rechargeable, which makes them especially convenient for travel. Ultimately, no one can tell you how to feel about any of these products. 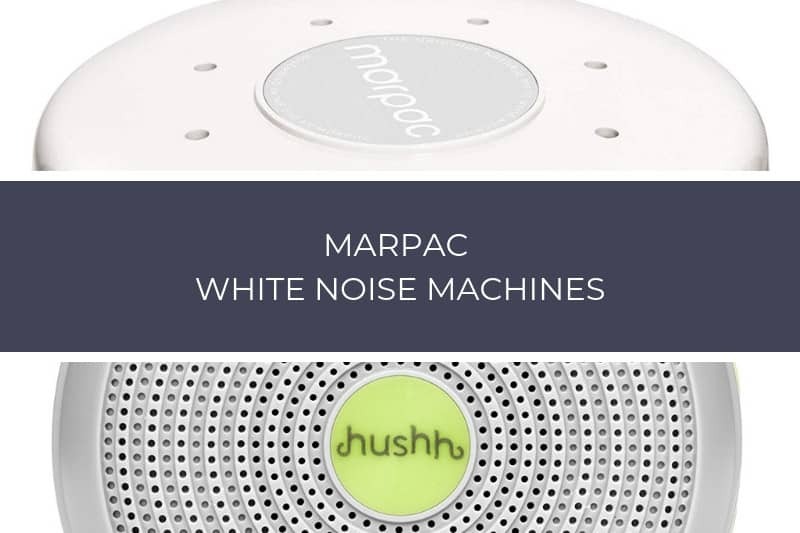 Even though I’m impressed with the variety of Marpac Whish, many people dislike electric white noise machines. If you’re one of those people, you’ll probably prefer the original Dohm device. Otherwise, you’ll have to take into account your needs and preferences in order to come to a decision.